Celebrating the life of Ollie King JR.
Be the first to share your favorite memory, photo or story of Ollie. This memorial page is dedicated for family, friends and future generations to celebrate the life of their loved one. 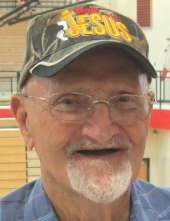 Obituary for Ollie King JR.
Ollie King Jr. passed away on Wednesday, October 24, 2018. Mr. Ollie was born on August 27, 1926 in Knoxville, TN to the late Ollie King Sr. and Callie L. Finney King. He served in the United States Navy during World War II and was a member of Lakeshore Community Church. Mr. Ollie enjoyed fishing but most importantly he loved the Lord and was a fisher of men. A visitation will be held on Saturday, October 27, 2018 at Lakeshore Community Church in Eatonton at 10 AM followed by a service at 11 AM. The burial will follow at Glen Haven Memorial Park in Macon at 1 PM. He is survived by his children Larry Ray King (Lenora), Sharon K. Gilkey (Larry), Paulette K. Taylor (Don), Mark Steven King (Karen), sister Mary Sammons, 7 grandchildren, 12 great-grandchildren and 1 great-great-grandchild. To send flowers or a remembrance gift to the family of Ollie King JR., please visit our Tribute Store. "Email Address" would like to share the life celebration of Ollie King JR.. Click on the "link" to go to share a favorite memory or leave a condolence message for the family.